What an easy breezy read! I really do love Nora's books. If I had to pick the one thing that makes Nora my favorite author it would be the dialogue she writes for her characters—whether it be spoken between friends, siblings, or parent and child, it blows me away every time! I can't help being drawn into the tight knit circle of amazing characters. 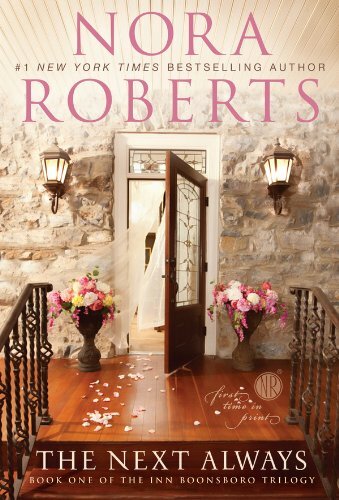 In this book, the first of the new Inn Boonsboro Trilogy, it's the Montgomery family and several remarkable women. This is Beckett and Claire's story. Of course there is chemistry between them, but there is so much more...some of the "more" being her three young sons: Harry, Liam, and Murphy. Beckett is one of three boys. When he is with Claire's boys it's chaotic and messy and loud (all things I detest in real life) and I want to be there to experience that bond. When Claire is dealing with the day-to-day stuff: meals, playtime, homework, baths, unending questions, I want to be the friend who is welcome in her life. When Justine Montgomery is talking with Beckett about him taking his time asking Claire out I laughed out loud. Just as I did when Beckett was "babysitting" the boys the first time. Claire's epiphany that lead to the title of the book is perfect! This book was filled with so many magical moments, and I'm not even referring to the ghost! Six months. We have to wait six months for Owen and Avery's story in The Last Boyfriend. Eager? Yes. But, I also know it will be worth the wait...they always are! 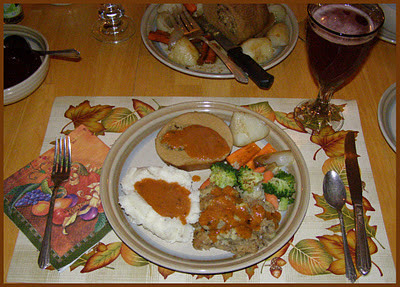 This was my first vegan Thanksgiving meal and my first Tofurky Roast. I followed the recipe on the box this time, but will be on the lookout for a different basting sauce for the next time. I found the recipe for the dressing online, and between suggestions from my husband and my own ideas, will make some changes next year. The recipe for the gravy (Basic Brown Sauce) comes from the book, 1000 Vegan Recipes by Robin Robertson. I've made it many times, but this is the first time I've used it as a gravy. It's delicious! The two recipes below are mine to share. The others are in the books I've mentioned. I've been a vegetarian for a very long time, but I was determined to make the entire meal free of any animal products. 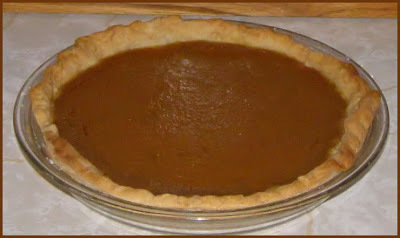 I have made the pumpkin pie a number of times but this was the first time I've made a basic crust in decades. Until last year I was able to find frozen crusts using vegetable shortening. They all have lard in them now. This forced me to get over my fear of failure and make it myself! My only difficulty was in rolling it out to the ideal 11" round shape needed. It wasn't perfect looking but it tasted a-okay! Several of the key ingredients are not available even remotely close to us, but with planning I was able to have them on hand. I am so pleased it turned out as well as it did, and next year...it will be better!!! Put potatoes and garlic in a large pot. Reduce heat. Simmer for about 20 minutes and drain. Place drained potatoes and garlic in a mixing bowl. Add remaining ingredients; beat with mixer until smooth. 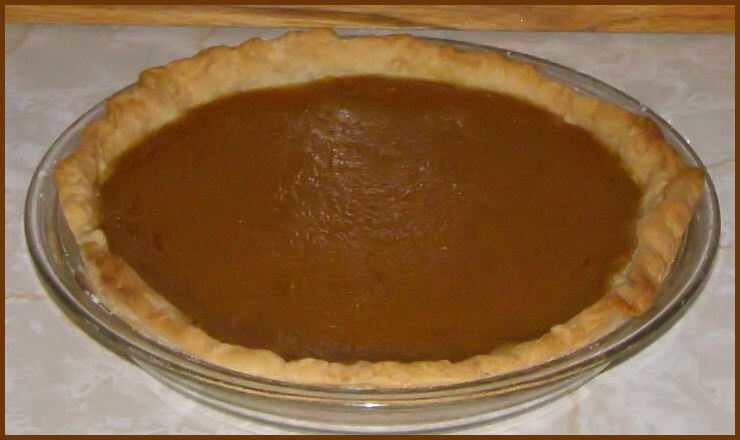 Pumpkin Pie and Crust from Scratch! Mix all ingredients until smooth in a large bowl. Pour into crust and smooth the top. Bake 15 minutes at 425°, then reduce oven temperature to 350°. Bake until filling is set, about 50 to 60 minutes. (You may want to put a ring of foil over the crust after it's browned to perfection to prevent it from getting too dark.) Chill. Kathy Reichs—#1 New York Times bestselling author and producer of the FOX television hit Bones—returns with a riveting new novel set in Charlotte, North Carolina, featuring America’s favorite forensic anthropologist, Dr. Temperance Brennan. Just as 200,000 fans are pouring into town for Race Week, a body is found in a barrel of asphalt next to the Charlotte Motor Speedway. The next day, a NASCAR crew member comes to Temperance Brennan’s office at the Mecklenburg County Medical Examiner to share a devastating story. Twelve years earlier, Wayne Gamble’s sister, Cindi, then a high school senior and aspiring racer, disappeared along with her boyfriend, Cale Lovette. Lovette kept company with a group of right-wing extremists known as the Patriot Posse. 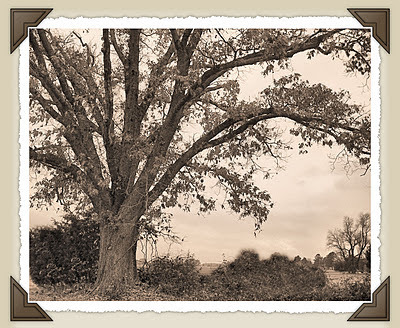 Could the body be Cindi’s? Or Cale’s? At the time of their disappearance, the FBI joined the investigation, only to terminate it weeks later. Was there a cover-up? As Tempe juggles multiple theories, the discovery of a strange, deadly substance in the barrel alongside the body throws everything into question. Then an employee of the Centers for Disease Control and Prevention goes missing during Race Week. Tempe can’t overlook the coincidence. Was this man using his lab chemicals for murder? Or is the explanation even more sinister? What other secrets lurk behind the festive veneer of Race Week? A turbocharged story of secrets and murder unfolds in this, the fourteenth thrilling novel in Reichs’s “cleverly plotted and expertly maintained series” (The New York Times Book Review). 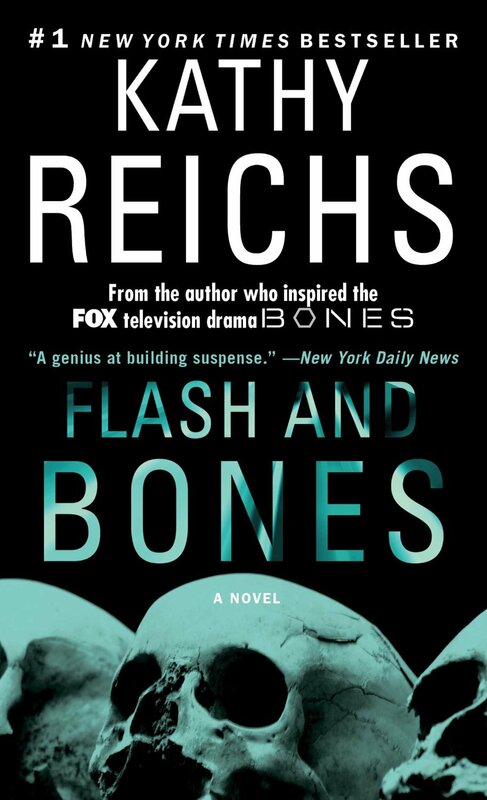 With the smash hit Bones about to enter its seventh season and in full syndication—and her most recent novel, Spider Bones, an instant New York Times bestseller—Kathy Reichs is at the top of her game. After reading three lovely works of literature in a row I was more than ready to dive into the latest Temperance Brennan mystery. I really do enjoy this series and have since reading the first book in 1998. I find Kathy Reichs' "bare bones" descriptions of things to suit me well. Flash and Bones was a very quick (a few hours) read, and, as usual, reaching her suspenseful chapter endings sent me directly to the next. Unlike the Temperance Brennan in the television series, the older Tempe in the books is no slouch when it comes to pop culture references. Although she doesn't know much about NASCAR, which plays a rather large part in this book, other characters in-the-know explain it succinctly to her. Not being a NASCAR follower myself I appreciated the abbreviated explanations (education) greatly. She references music, books, movies, and technology by name, which alludes to her awareness of a world outside of her work. I very much enjoy Temperance's internal (often snide) comebacks and the way she works through questions and case evidence to put the pieces into place. There are some light moments introduced into the story by Tempe's soon-to-be ex-husband's new fiance. Andrew Ryan and Tempe have only minimal contact via phone and email in this book. However, a rather hunky ex-cop seems to have revved Tempe's engine and caused her heart to go flip-flop. Wonder what's going to happen there. I can't wait to find out! It's been five months since my last new music update and I'm thrilled with the awesome new tunes gracing my library and iPod. Alternative, rock, pop, and a soundtrack...REALLY good stuff! I especially feel "with it" when my teenage daughter wants to listen to my music! w00t!